My grandfather moved to the United States when he was 15. He was seeking a better life, and when he got here, lied about his age to enter the army. Eventually, he met my grandmother and they settled down in a small town in central Washington. One of his most proud accomplishments was sending all of his six children to college. In my own personal experience, my family moved to the island of Oahu in the state of Hawaii when I was 8. We moved from a small town in Idaho when my father, a Presbyterian minister, got a job at a church in Honolulu. You would think that the cultural change was massive. It was, for my parents, but for my 8-year old self, I remember landing at the airport and being met by people who put more leis on our family than our shoulders could accommodate. I remember staying in a hotel, I remember that our first rental house had a stream running through it with a bridge over, and I remember that the kids at school didn’t wear shoes. I didn’t want to wear shoes either. The warm weather was a nice change, and I loved wearing shorts during the holidays. By the time my birthday arrived, I had made enough friends for a small party. I recall my parents commenting that there were no Caucasian (haole) girls at my party. I dismissed the comment, there was only one other haole girl in my class, and I didn’t really like her. Growing up in this uncommon mixture of cultures and being forced to do so at the age I was has forever changed how I think about diversity. How I perceive our differences, and how important it is to have the child-like innocence of being oblivious to the differences of culture and skin. I tried seaweed for the first tine not long after we moved there. I thought it was gross. But when all of my friends were eating seaweed and rice together in musubi—I learned quickly to like it. I even began taking my shoes off when I got to school. Life changed when middle school started, and we and my classmates graduated to a much larger school. I was twelve. All of a sudden, things were different. My best friend from elementary school stopped talking to me. We were in different classes, but her skin color was darker, and she was also born on the island. She was way more interesting and cool than I would ever be. Suddenly I wasn’t worth her time. My skin color became a liability. At the time I would have done anything to not be white, which also equated to boring. We moved back to the mainland right before I started my freshman year of high school to St. Louis, Missouri. This time, I did experience culture shock. We entered a largely white town, whose high school had inner city African American students bussed in, still apart of the desegregation efforts implemented in 1954. I struggled to understand the divide, why when you went into the lunch room it looked as though someone had drawn an invisible line, keeping the kids who grew up in different parts of town, and had different skin colors, separate. I now live in Seattle, which is more culturally diverse than St. Louis, less than Hawaii. I believe it was my formative years in the islands that shaped me. 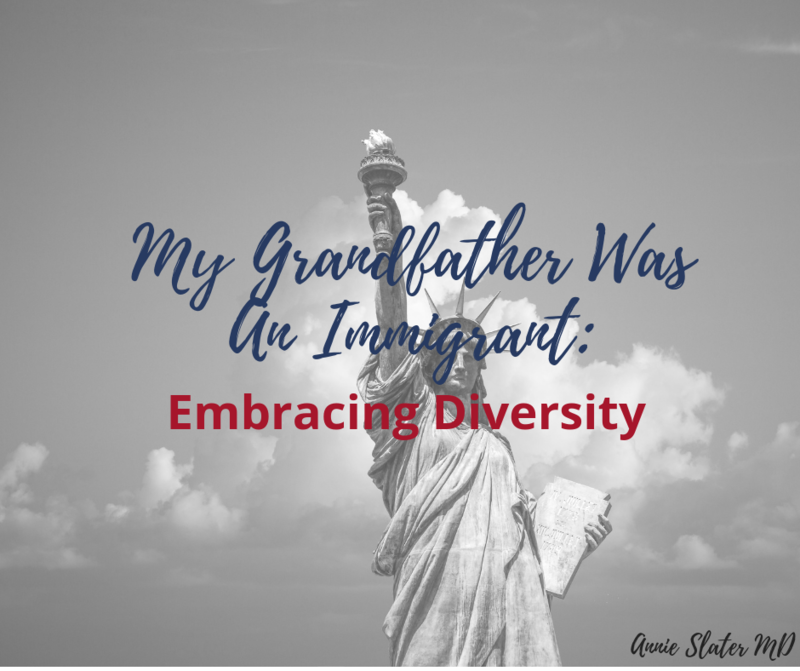 I feel fortunate that although I know I still have my own implicit biases, I am as not susceptible to the fear many have developed around immigrants. I think diversity is vital to our society, it helps us to be kinder and more compassionate. It helps us to be forced to put ourselves in someone else’s shoes, to try to see the world from their perspective. In thinking about diversity and immigration and where I live, I realized that I rely on a lot of immigrant women to help make my life better. I need them, and it would be so tragic if they were not in my life. I have Isabel, my Chinese masseuse who helped me when I was trying to get pregnant to ease my mind, but also relieve my stress. I have Nancy, my Vietnamese nail manicurist who invariably always asks me how my mother is doing, even though the last time she came in with me was over a year ago. Raj, an immigrant from India who owns the wax salon I go to, always shows me pictures of her daughter, who has about 10 times as much hair as my son!! Then there is my tailor, who is an immigrant from the Philippines, who I hadn’t seen in a few years, but when I brought her my latest request, she insisted I bring my son when I came to pick the item up because she really wanted to meet him. I think I probably unconsciously chose these women to be in my life, possibly because of our differences or maybe they just felt trustworthy. They are all excellent at the jobs they do, and I know my life would be less rich without them. We need as a society to reject this narrative of ‘otherness,’ that because someone was born in a different country, or may have a different color of skin or religion, they are dangerous or ‘less than,’ or not deserving. We should instead be embracing the mindset of our forefathers, that America was made for you, and for me, that it is a place where those seeking asylum can rest. We are fortunate to live in a country where we are free. I am enjoying my freedoms, but I know I didn’t do anything special to deserve them. I am fortunate that my grandfather made a choice to leave his country and settle here. It was luck that he came and was able to make a life. We have to embrace our inner empathy. We are all just people, after all, trying to keep ourselves and our children safe, and that when we show each other love and compassion, we all benefit. What I am truly afraid of is the hate that we are sowing. I am afraid of unrestricted gun access that could hurt me in my place of employment or my children when they are old enough to go to school. I’m afraid of the rhetoric that has consumed our society declaring people seeking refuge as ‘dangerous’ and family separations as acceptable. I am scared that one day my cute, silly, fun-loving son will treat another person with hatred due to the color of their skin. Those are the things we all should be very afraid of. After all, most of our ancestors were immigrants at one time. Please vote. And if you can, try to imagine what it must be like to travel far and long in order to try and make a life in another country, because the one you were born into is too dangerous. Try to find compassion for those who are different than you. Excellent insight into the challenge within our culture Annie! May today’s election be the beginning of the road back to decency, mutual respect & mindfulness. Good blog…as usual! I recently have become friends with several Hispanic individuals. They moved her at different times, ages and from different countries. Although we are only starting to get to know each other, learning about them and their lives and why they came here has only inriched my life. I honestly can’t wait til we get together again to sit and visit for hours. My life is better for meeting them. Thank you for your thoughtful and engaging blog!